Really? 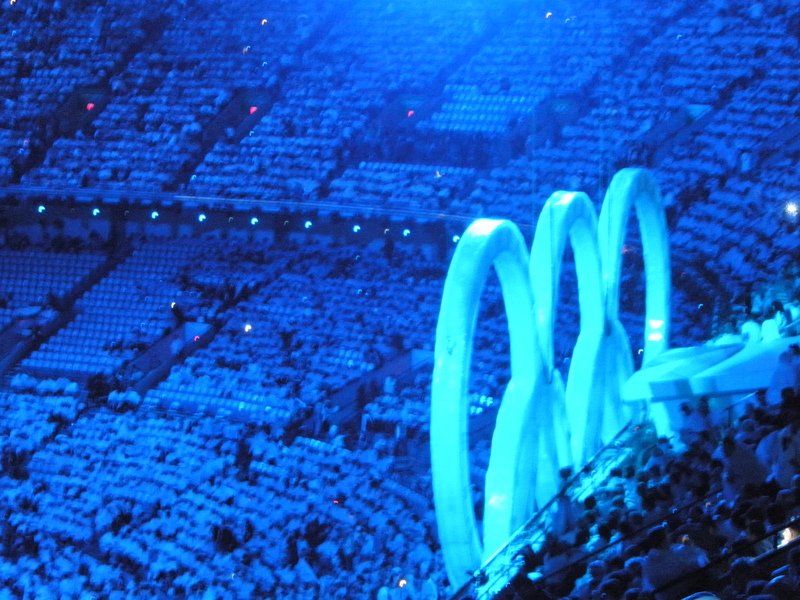 Has a whole year passed since the Opening Ceremonies of the Vancouver 2010 Winter Olympics? Where has the time gone? For me at least, 2010 was a wonderful year. Besides Vancouver 2010 I was fortunate enough to travel for three months in Europe, as well as live and learn to find work in Vancouver. By a few months after the Games I wasn’t writing as much as I would have liked. Heck, as you know I’m still not, but maybe I should make myself a Vancouver 2010 1-year anniversary resolution to get back at it! Still in my Vancouver 2010 gear, even when I'm logging core! I’m currently working as an exploration geologist (look ma! my degree came in handy!) 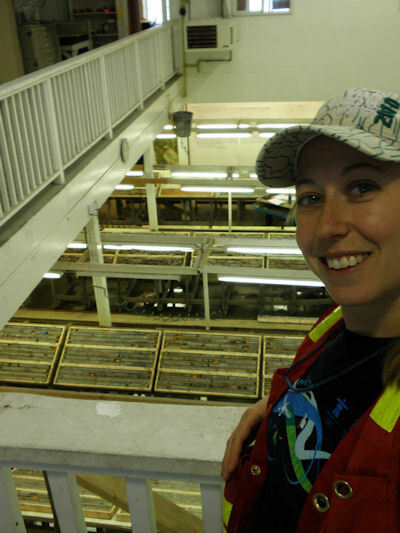 at a mine called Mount Polley in central British Columbia. It is a gold-copper mine and I help with brownfields (ie. near mine) exploration including logging core (most of my job), siting drill rigs, doing down drillhole surveys, and anything else that needs doing (ex. shoveling snow… a lot of snow). I have spent most of my professional and academic life avoiding working on ‘metals’ deposits as I enjoyed working with gemstones and industrial minerals but I am very grateful for this opportunity to learn and grow. It’s definitely a different life living at a mine but it is fun as well. There are a lot of good people up at Mount Polley. 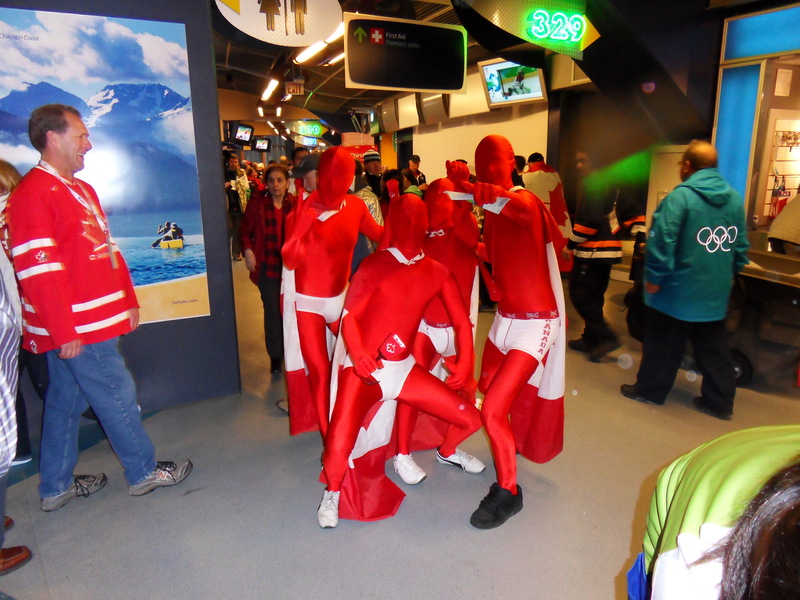 But because I’m working at the mine right now I am missing the Vancouver 2010 anniversary celebrations in Vancouver. These are the first Vancouver 2010 events that I have missed in over a year and a half! So, I’m a little sad today. Sad to not be in my blues. Sad to not be out photographing, documenting, participating and enjoying the excitement of remembering our very successful Games, both in sport and in Canadian Spirit. I love the Red Men! I miss the seas of people in Red I miss the maple leafs flying everywhere. I miss the Red Mittens. (I think I even miss the crying several times a day in joy). I miss meeting new people. I miss volunteering in the Vancouver Olympic Village. I miss my blue jacket. I miss people smiling all over town. (Right, enough, I’ve gone and made myself cry again, but not in a joyful way). Let’s aim for some happy tears shall we? 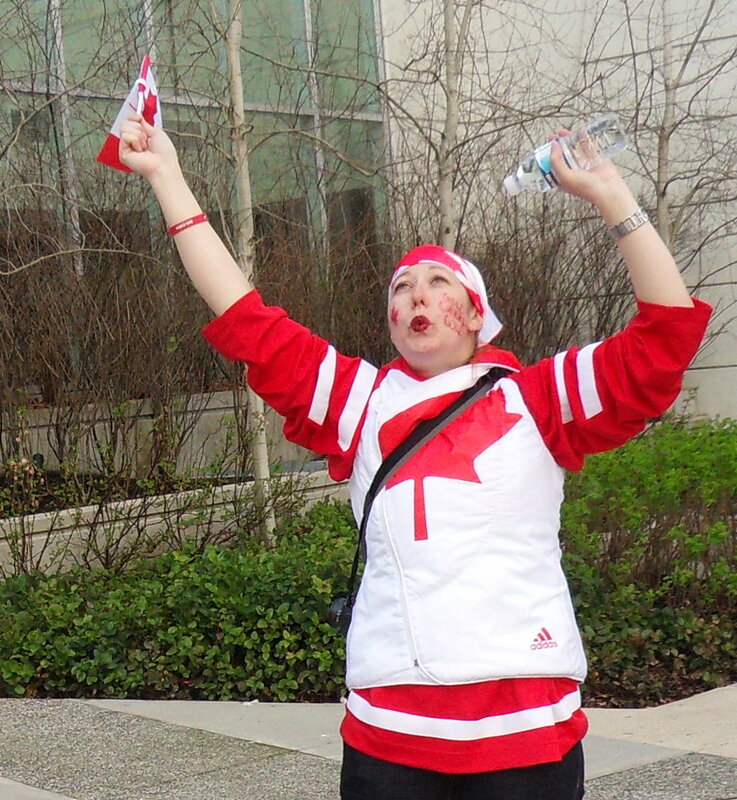 I’m grateful for everyone that I met or got to spend time with because of Vancouver 2010. There were so many wonderful people that I’m not going to try to name everyone, nor even one, because you all know who you are. From fellow blue jackets to Torchbearers, pin traders to 2010vanfan readers, family, friends, scavenger hunters, fellow fans and line-standers, fellow bloggers, near-fellow journalists, incredible athletes and adorable Mascots. As I suspected from the start, Vancouver 2010 was for me about meeting people. I was sure that our city, province and country would come together as never before. And we did! Bigger and better than even my imagination led me to hope (and I have a pretty darned good imagination if I do say so myself!). Olympic Rings during the Opening Ceremonies. 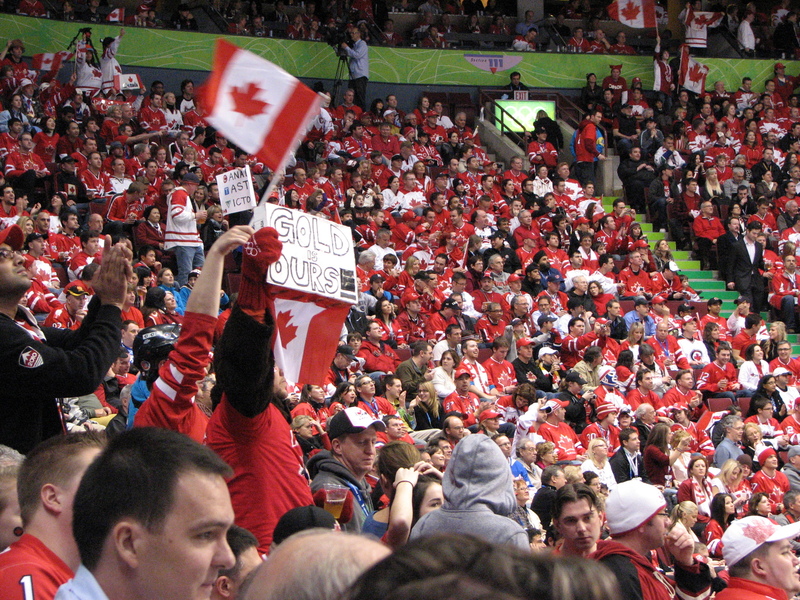 Vancouver 2010 is something that has touched the hearts of many. It has changed the face of all of the participating cities and will continue to bring change to them for years. It allowed many of us to take the patriotic pride that we had kept quietly burning in our glowing hearts and, like opening a lantern to light the world, share our joy, our love and our Canada with everyone. If you made it to the anniversary celebrations today please share with us what you loved. I wish I could be there, but I promise my heart and spirit are. 2010 Santa Claus Parade – Call for Blue Jackets! Hey Vancouver 2010 fans! My Olympic friend Keith let me know that they’re looking for some Blue Jackets to walk in this year’s Santa Claus Parade on 5 December. I’ve already signed up and I hope to see you there! Here is the information. On Sunday, December 5th 2010, 300,000 spectators will gather in downtownVancouver for the annual Rogers Santa Claus Parade. As we wrap up 2010 andcelebrate the success of the Games, we would love for you to play a key role in theparade by joining VANOC CEO John Furlong and between 100 and 150 “blue jacket”2010 Winter Games volunteers as this year’s Parade Grand Marshal entry, sponsoredby YVR. This year, the Parade will feature 60 entries from BC and the Pacific Northwest, with entries ranging from marching bands and dancers, to large Christmas-themed floats,and of course, Santa Claus himself. In addition to the 300,000 spectators lining the parade route, thousands more will viewthe Parade when it is broadcast twice in December on OMNI BC in Vancouver andCitytv in Vancouver, Edmonton and Calgary. In addition to being the official kickoff to the holiday season, the Rogers Santa ClausParade is one of the biggest fundraising and food collection events of the year for theGreater Vancouver Food Bank Society. We hope you can join us! To be a part of the 2010 Rogers Santa Claus Parade, please contact MichelleWoywitka at mwoywitka@pacegroup.com or 604.646.3565 byNovember 15th, 2010. To find out more about the Rogers Santa Claus Parade, pleasevisit our website at http://www.rogerssantaclausparade.com. Well, with the Vancouver 2010 Olympic and Paralympic Winter Games over I’m moving on to new projects. My main project is my new blog called NerdBird. If you’ve enjoyed 2010vanfan please do take a look, I would love to have you along on my new journeys! It’s so hard to believe that it has been 55 days since the Closing Ceremonies of the Paralympic Winter Games of Vancouver 2010. From the days when I was known more often as 2010vanfan than as Andrea. But here we are. And, for the first time in a while, all us folks in Vancouver had a “Vancouver 2010” event to celebrate. Today was the public opening of the Vancouver Athlete’s Village. And it was quite the party! Only some of the condominiums in the Village had been sold already, the rest are coming on the market now. So this event was a way to generate sales as well as really, the first chance for the public to see what the Athlete’s Village was like, and what it will becoming in the next few months and years. And really? It was fascinating, in so many ways. Businesses that will be opening in the coming months had displays. These businesses include Urban Fare (a grocery store), London Drugs and Starbucks. The wonderfully beautiful Salt Building will host a microbrew pub-restaurant amongst other businesses (it really is a gigantic building) and there will be a lot of public space, in the square and along the Seawall, where people will be able to gather amongst new art pieces and beautifully designed landscaping. I think that marketers are amazing people. I do truly believe that many Vancouverites would have been happy to come down and see the Village, but a lot of little extras were offered to entice us all into this new community. If you were one of the first 250 ‘blue jackets’ into the Village (with your accreditation) you received a $25 gift card for London Drugs (I happily was in the 250 and have already used mine to buy myself some Cold-FX for my trip, fend off any ‘airplane air’ bugs). The various businesses entering the community had hot dogs, iced tea and other products available by donation. The Olympic and Paralympic Medals were on display for a while. There was a ‘passport’ contest on where if you collected stamps from the display suites you could enter to win prizes. Olympic and Paralympic banners were available for purchase. Olympic and Paralympic athletes were available for autographs. Even more exciting (to me at least, and yes, I am silly) was the presence of one of the inflatable beavers from the Olympic Closing Ceremonies! I’d also like to mention that John Furlong was there for the Opening, amongst many other dignitaries that I do respect, but John, well, I don’t know that I’ll ever be able to hear his name without feeling awe, respect, joy and gratefulness. Nerdbird and a giant beaver! John Furlong speaking to the crowd in front of the Salt Building – he got the loudest cheers. Back to the event itself… I found it odd. Very odd. This is because I am spoiled as I was already quite familiar with a lot of the buildings and spaces of the Village from my time volunteering there. It was strange to see so many people in it. It was strange to see the Salt Building wide open, without couches and video games. It was odd, though fantastic, to see the new bird sculptures in the plaza. It was wonderful to see how much everyone was enjoying the area. It was busy and excited, but in a laid back exploratory sort of way. I wish all new neighbourhoods could be welcomed to our cities with this sort of party! One of the sparrow sculptures in the Plaza. And the other. They are really quite spectacular in person! Besides the Village opening my day also involved meeting up with Rachael, my Uncle Michael, and Charlie for lunch. We went toFloata restaurant in Chinatown for dim sum. This was my second time there and I was much more daring. It’s a good thing that other people had an idea what they do and do not like as I would have just said yes to everything! There are so many wonderful things to eat, but even with restraint, I left stuffed (done in by the green dessert dumplings with a seasame seed filling, divine!). I also visited some friends that were having a get-together at Kits (Kitsilano) Beach really quick before heading home (via Granville Island to buy a papaya for breakfast). Vancouver was perfect today. Sunny, warm, friendly and welcoming. And I was covered up enough that I didn’t add to the slight sunburn that I got yesterday. I always forget at this time of year that the sun will get me if I’m not careful, but I’m reminded now and will be much more careful for the rest of the summer. If you have a chance to visit this year – do! If you live and work here in Vancouver – take a day (or several preferably) to see, to remember, what a wonderful city it is. And if you find yourself on a patio somewhere, maybe with a bellini, glass of BC wine or microbrew beer in hand, take a second to toast the city. I’ll be thinking of it while I’m away and it would be great to know that you’re all enjoying it as much as you can. I’d like to thank everyone that has taken time to email me their photos and video montages of their Vancouver 2010 experiences. I had somehow thought that I was finished with my crying at the wonder and joy of the Games, but these videos have proven me wrong. As well as made me consider creating my own montage! So here are the links to the videos I’ve seen so far. Do you have one or maybe an online photo album? Feel free to post it up as a comment or email me your link. I love how much people enjoyed the Games! The Quatchi Kid – in his natural environment and at Easter. If you haven’t seen the Quatchi Kid yet, you’ll definitely want to check out his videos or his Facebook page. So darned cute! I’m looking forward to seeing your memories! If you have been in Vancouver over the last week you will be familiar with our terrible weather this last week! It’s been cold, rainy and darned windy! The wildest day so far was on Friday. The sounds of the wind howling had me convinced that some trees were going to be blown over in the city. And, I was right. When I was walking the dog Saturday morning one of her favourite trees (I think squirrels live in it) was blown over – right across the bike path. It was a pretty sizable tree and it looks like it destroyed another tree when it fell. I’ve seen a broken sculpture, an awning blown completely off of a building, and even now I can hear some metal sheeting that has been pulled loose blowing in the wind. The squirrel tree blown over. The trunk of the tree seemed to have ripped itself apart as it fell. It is truly majestic and amazing to see. The beautiful heron sculpture in George Wainborn Park in Vancouver is only flying with one wing right now. The city is much quieter these days. LiveCity sites are being returned to parks and everything is being put away. It’s a bit sad, but I’m starting to see the beauty of how an event like this is meant to be a small capsule of time. A perfect shining crystal of achievement, of friendliness, and of pride. David Lam park is looking more like David Lam park and less like LiveCity Yaletown every day. Science World is no long Sochi Russky Dom. Scrim (the pretty decorative fence cover) has been removed from all of the fencing. Heck, most of the fencing has been removed. Yesterday a big crane/boat thing was pushed into False Creek to remove the buoys holding the barrier across the water in place. The crane being pushed into False Creek. Ah dear… my PODS (post-Olympic depression syndrome) must really be bad! I’m turning to children’s books for comfort. Thank goodness for Dr. Seuss! Besides watching the city slowly be transformed from Olympic and Paralympic Games host to regular city, today was the first day I’ve had a chance to look at the blogs that I used to read every day. It is wonderful to get to read posts from Christina, Joyce, Rachael and all the rest on my ‘Daily Read Sheet‘, even if it is after the fact. We had similar experiences and we each had unique experiences, but all in all it looks like everyone had an amazing time, and we’re all quite sad that it is over. I hear murmurs from all directions… from people volunteering for Vancouver 2010… from people working for VANOC, contracting companies or the Olympic Superstore… and from fans of the Games… I am hearing ‘See you in London‘ often in a slightly hushed voice but I am hearing it a lot. We’re going. And we’re planning already. Many of us have already registered to volunteer (you can do so by visiting the London 2012 site here) and a few are even looking for jobs (yes, I’m one of those). As John Furlong said to us in his speech at the Closing Ceremonies of the Paralympic Winter Games – “Once a blue jacket, always a blue jacket”. And there are going to be ‘blue jackets’ showing up at Olympic and Paralympic Games around the world for a very long time. (Some of us are already planning further than London – on to Sochi… Rio… Annecy/Munich/Pyeongchang…). Oh! And if you are interested in London, you may want to consider registering for ticketing. You don’t have to buy any tickets yet but they’ll add you to the list so that you don’t miss out on ticketing updates! I am working on getting my new blog site set up, however as I am going to be hosting the site myself instead of using an online host it is a bit more complicated than I am familiar with. It is taking a little longer than I had hoped, especially as I have post ideas stirring in my brain. I think I may be launching it anyhow, with improvements to come as I learn how to do the things I’d like to do. So keep your eyes peeled over the next few days and I’ll see what I can do! As always, thank you merci for your continued support and your friendship and enthusiasm. It has been a great ride made all the better having shared it with you. Technically both days 9 and 10 of the Paralympics have passed since I last wrote, however I sort of missed Saturday night so it’s been all one great big, fabulous day for me! It’s been full of lines, a great party, a visit to Whistler and the Paralympic Closing Ceremonies. I’ll start at the beginning shall I… with the lines. The British Columbia Government has started the sale of assets from Vancouver 2010 to workforce and volunteers of the Games (it will be open to the public from Saturday 27th). As a volunteer we were allowed to bring one guest to the sale. I brought my uncle, Michael, along with me. Michael is the Executive Director of the new Chilliwack Cultural Centre. As they’re just finishing building the new facility he needs a lot of things to fill it up with, like furniture, mop buckets, fabric steamers, measuring tapes and much, much more. The asset sale was the perfect place to start getting these items at a great price. Now, I spent many hours in line to ziptrek on Friday, and it was well worth it, I had not however anticipated really long lines for the sale. I knew there would be lines… but not as long as they were in real life. We arrived a bit before the sale opened at 9am and met up with Dave and Rachael. We didn’t leave until 4:30pm! We waited in line to get in – about 1.5 hours (luckily there was a food stand with very yummy breakfast wraps) and when we got inside the warehouse I immediately got in the payment line as we had heard that it was going to be a wait in there as well. Each of us took turns in line, though Michael mostly shopped, and shopped, and shopped. We started a pile, a very big pile, that had to be guarded from other rampaging shoppers. It was a blast. There were all sorts of fascinating people and had lots of time to get to know them! We were pretty darned successful all in all. We got lots of things for the new Cultural Centre. And I even found a few little things for myself, like a great umbrella! From the sale I headed home to change. I had been planning on getting up to Whistler to hopefully see some alpine skiing, as my ticket for Sunday had been cancelled and the races moved to Friday and Saturday. But, as I spent way more time at the sale than I anticipated I decided to stay in Vancouver instead and go in to the Village to help in the Salt Building. It was the last real night that the athletes would be in the Village and many of them had shiny new medals to show off. It was a great night! Sumi planning his next shot in shuffleboard. The party lasted into the not so wee hours of the morning! Sumi came in to visit early in the night. I’m pretty sure that members of all the teams in the Village came in at one point or another, though some stayed much longer than others. I got to hold Gold and Bronze medals from sledge hockey! There was a dj that rocked the place. I’m so glad that I had the chance to be there and be involved. I really am spoiled rotten! However, with the party going to the morning hours it did force me to readjust my plans for Whistler again. I headed up around 9:30am (I had been planning on catching the 6:30am bus!). I met Justin and Mike for lunch. I napped. I shopped a bit and then met up with Rachael and Dave for dinner before the Closing Ceremonies of the Paralympic Winter Games. The Ceremony was great! There were lots of fireworks and fantastic acts. I think my favourite was done my an artist that created a constantly moving art piece, I think using sand. It was really beautiful! The Paralympic Flag was lowered and passed on to Sochi. The Paralympic Flame was extinguished, with a Torch passed on to Sochi. And then… Vancouver 2010 came to a close. I had been thinking that I was ready for the moment. It’s been a wonderful experience. Amazing sport, great art and a coming together of people in a way that won’t be duplicated for a long time. It’s been exhausting but well worth it and I thought I was ready to say goodbye. But standing at the Closing… I realised I still wasn’t ready. I didn’t want to give up the flag waving and cheering, the amazing sport and even more amazing new friends, the visitors and locals all coming together in joy. I wasn’t ready. I’m still not ready but it is all done now, whether I’m ready or not. The projection of the sand art. He constantly manipulated it and changed its entire look with the sweep of a hand! Fireworks at the Vancouver 2010 Paralympic Closing Ceremonies. Rachael and Dave after the Closing Ceremonies. Me after the Closing, with the very clever noisemaker/banner that they handed us at the door. The noisemaker was great. It's hard to make much noise clapping when you have mittens on! I’m not quite done writing yet. There are a few things I’d still like to talk about, and maybe some wrap up stuff, such as how the city and the region goes back to ‘regular’ life now. I suspect my PODS (post-olympic depression syndrome) is really just starting. But I’ll let you know how I’m going. Until then, thank you merci!